I’ve tried to explain to you before… the eating habits of my father. He prefers Spicy Doritos and Cheese Curls over lunch, Ring-Dings and Peanut Butter Cups over dinner. He brings home bags of fresh Soft Pretzels and boxes of Tomato Pie (which is to die for, for the record). I try not to give in to his snack cravings, but this week it happened to be his BIRTHDAY… so a diet-no-no recipe was in order. 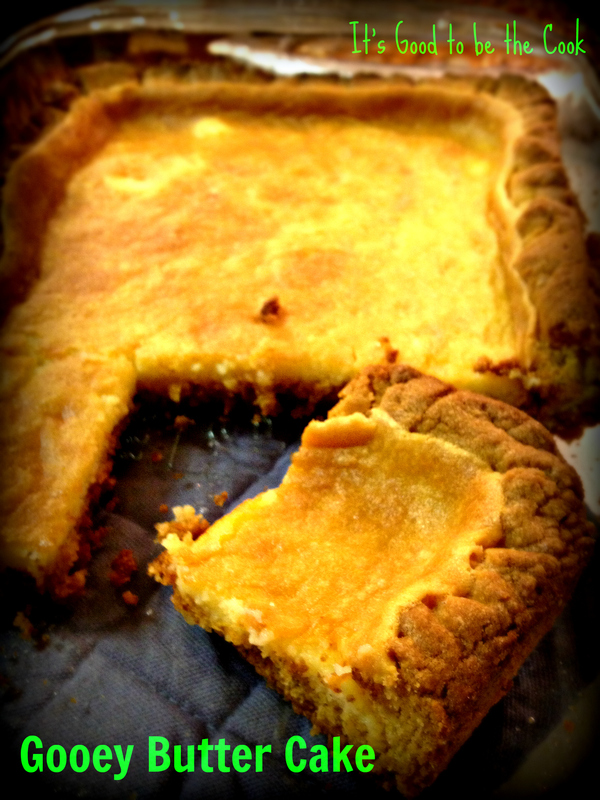 My Dad used to love this “butter cake” from a local bakery. Apparently this bakery has discontinued his favorite cake for some time now, so my Mom wanted to try to make it herself. 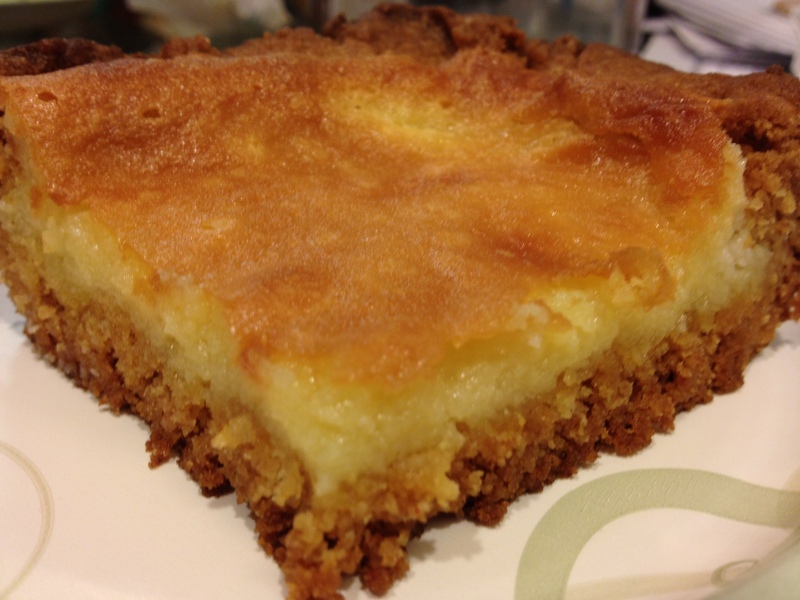 Our cousin suggested googling “Ooey Gooey Butter Cake”. She said there was one recipe she’s tried that is EXACTLY like the one from the bakery. We googled, and we found out that Paula Deen – duh – has a “famous” Butter Cake. It must be good, Paula! 1. Preheat oven to 350. Combine cake mix, egg, and melted butter and blend well in a mixer. Spray a 13×9 inch baking dish and gently pat the cake mixture throughout the bottom of the dish, creating a crust. 2. Now, rinse out the bowl to your mixer. Beat the cream cheese until smooth in the mixer. Add the eggs, vanilla, and butter and beat until well combined. Add the powdered sugar little by little and mix well. Spread over the cake and bake in the oven for 45 minutes. Note: Start checking the oven around 40 minutes into the baking time. You don’t want to overcook it. 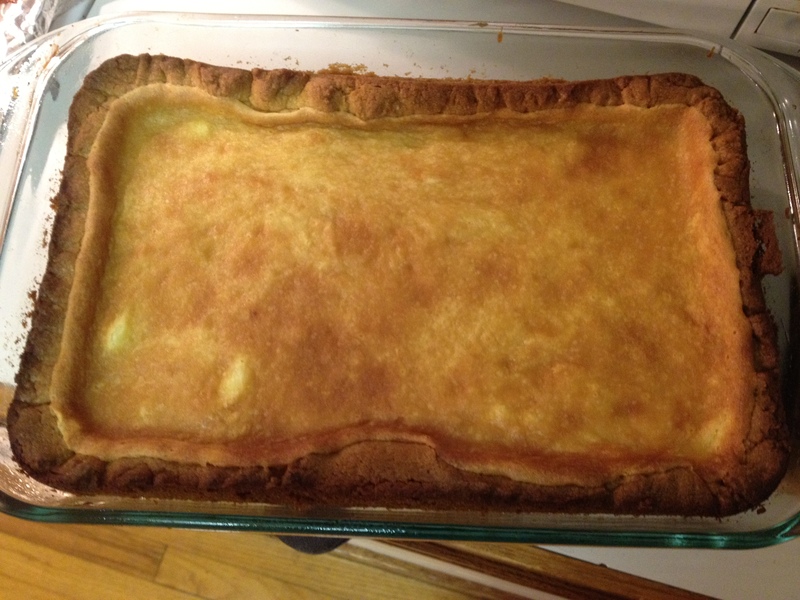 Ours was slightly browned ontop but when you giggled the baking dish, the middle was still not completely set. Um… wow. I allowed myself to have a piece for his birthday. My entire family was completely… I said it… WOW-ED by this cake. My Dad loved it, and even complimented it by saying it was better than the one from the bakery. I’m so glad my Mom thought to make this for him, it turned out to be really special… and naughtily delicious!